How did your Monday treat you? Mine was ok - much better after Ina and I put in 3 miles after work. Today I thought I would tell you about the farm to table dinner that Dan and I went to on Friday night. 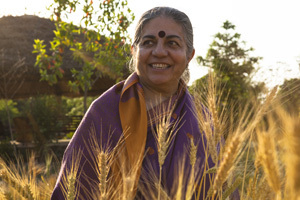 The dinner was with Dr. Vandana Shiva, who was in town giving a talk about her passion for food and agriculture sustainability. She is an heirloom seed collector (which piqued Dan’s interest) and a physicist and GOOD food promotor (which piqued my interest), so on a whim, we bought tickets and went. It started out with a social hour of appetizers and drinks. Everyone there was very interesting and welcoming. I think that they all knew each other, but were nice enough to make small talk with us. This event was hosted by Cultivate Kansas City, and honestly, I cannot believe I haven’t been to an event with this organization before. They are simply amazing and I want to be all of their friends. They work in Kansas City to grow food, teach people how to grow food, and build a community around good food. Yes, yes, and yes. After the cocktail portion, we went into the dining room where we sat with a few interesting people. A woman who runs Lucky Star Farms. She was really interesting - she used to be a physician’s assistant and quit that career to become a farmer. Her farm makes it a very high priority to see only 100% grass fed beef. Dan and I talked to her about buying some meat! There was a young guy who worked on a farm in Arizona through a program called Good Food Jobs. From what I understand, you pretty much tell them you want to work with food and they find you a job. He previously went to Peurto Rico with a similar program called GOOF. There was a girl who was a yoga instructor and a college student who was majoring in women’s studies. There was a guy who had just planted a monarch garden in his backyard. There were two people who acted like they didn’t want to talk to us at all. Then there was Dan and me - pretty much completely out of the loop. However, after that night, we want to be in the loop! Dr. Shiva gave a little talk, and there were two things she said that stood out to me. Just to be clear, I am largely paraphrasing here. 1. Many people fret over what they eat down to the last detail. How much protein does it have? How many calories? Is it balanced? She said just ask yourself, “Does my food have 5 tastes?” If it does, then you are good to go. 2. Good health comes from eating good food. Bad health comes from eating bad food. Period. Dan and I left with a sense of power and initiative. We can’t wait to plant our little garden! That sounds like such an amazing night! I need to find a farm to table dinner! Hi Racheal! Tonia here, from Lucky Star Farms. It was such a great evening and a joy meeting you and your husband. I was so enthused by your passion for making the world a better place. Glad I found your blog. Keep in touch!